Scott Hoffner is warm, personable, and truly passionate. Passionate about food, passionate about family, and passionate about his local community. 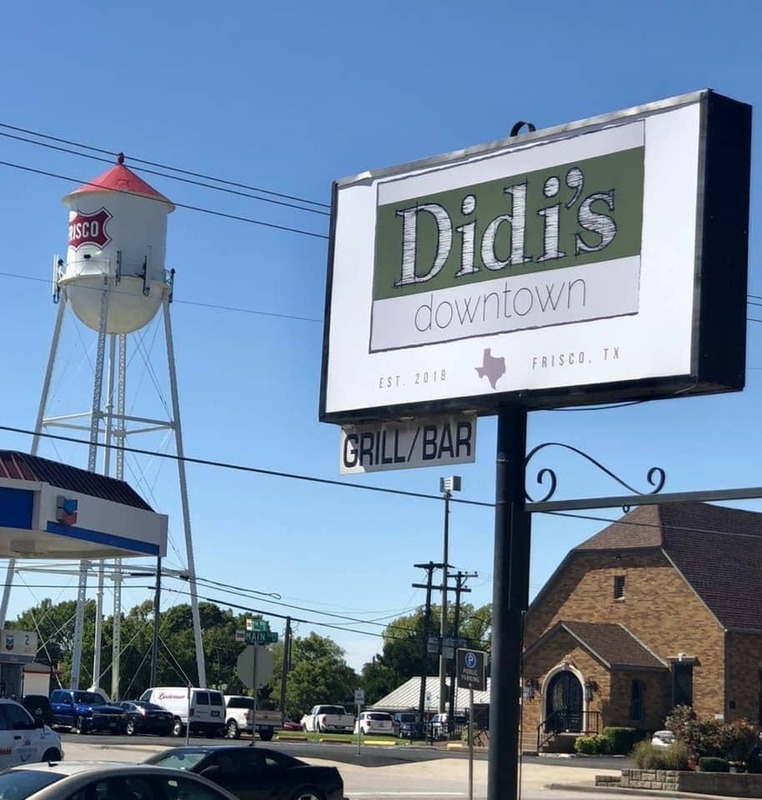 Add to that his vast culinary experience and there’s even more reason to celebrate with the owner and Executive Chef of the Rail District’s newest eatery; Didi’s Downtown. A native Texan originally from Plano, he remembers coming to small-town Frisco to fish as a young boy. His connection with the food world started at age 11 when he was a dishwasher in a local restaurant. He has worked in various Texan venues and at one point was personal chef to the family of professional basketball player Tyson Chandler. Traveling the country, Scott has lived and worked in Montana, Colorado, Austin, Rhode Island, and California. One of the more notable opportunities he recalls was serving as Executive Chef at the five-diamond, five-star resort Ojai Valley Inn and Spa, which involved overseeing seven restaurants, banqueting, and room service. That was a lot of work in a place, for example, where you have over 70 guys employed just to take apart and clean the kitchens. With all the growth in Frisco and new people moving here by the day it makes perfect sense to me with a bonus of the venue being just over a mile from my house. Being near family is important to me. While chatting he took a moment to commend his wife on her amazing support through all the moves and eventually the decision to come back to Texas. He explained how they considered various restaurant opportunities in different locations over the years and this one just seemed like the perfect fit. Now fully settled, the family appreciates the lifestyle theme of “Live, Work, and Play” that exists in Frisco. His children attend the local schools and are involved in children’s theatre, while his wife is a local Montessori teacher. Hoffner spent the last few months of 2018 gutting 7210 Main Street and transforming the one-hundred-year-old building into a family-friendly neighborhood venue. Just a week before Christmas, Didi’s Downtown officially opened; Scott is delighted to present a place of his own where he can finally share his take on great family meals in his own space. His menu offers ‘made from scratch’ food with many specials and seasonal dishes. There will be something for everyone, but specials are where he describes himself as ‘superfood forward’. I have connections on the coast to ship the fish here fast and ensure quality like no other you will try in North Texas. Fish doesn’t need to be described as ‘fresh’ – I mean…. is there any other kind? It doesn’t need an adjective placed in front of it. If it’s not already fresh, it’s not quality. Throughout the year Didi’s will present live, authentic music, unique events at weekends and eventually, some standup comedy. I have friends in the music business and intend to bring utter professionals to the restaurant who will always offer something exceptional in performance to my guests. During warmer days and throughout the Spring and Summer, he intends to make full use of the patio for family-friendly events, children’s theatre, and entertainment. He also wants to work with the Frisco schools to give back via discounts and spirit nights, as well as to host local sports teams with their families. Inside Didi’s you’ll find various types of seating for any size party are available and should you want to host a group event, the ‘Kings room’ is an ideal private spot but not totally cut off from the atmosphere. One of the dining areas offers a more intimate setting. A long narrow room almost reminds me of a train car, with smaller tables for two lining the windows. Here you can grab a date night or catch up with a friend over coffee and dessert, snacks and wine. Or even just take time out to watch the world go by with a perfect view of busy Main Street and the historic water tower in the heart of downtown Frisco. With a spacious inviting patio and plenty of parking, Scott intends to add a bike rack. He looks forward to seeing people just cycle, walk up or park to drop by, spend time and become regular familiar faces. Didi’s can be a place where they can take time out from the grind. Relax, hang out, enjoy great food and drinks throughout the day, and experience live music from time to time. Somewhat of a Celebrity Chef, Scott’s also a regular on Fox 4 News Good Day where he shares his twist on some great family favorites. The day I stopped by for lunch I enjoyed his home-made chips with salsa and queso – which were nothing short of outstanding! A local bakery is providing delicious bread, tortillas will be made from scratch, and all meats will be cured and sliced in-house. Didi’s has a full bar and Scott worked with Eddie Eakin, a well-known mixologist in Dallas circles, to design the cocktail menu. Working now on a project like this means I can be more involved in every aspect of the business and pay attention to the details to offer superior service daily. So happy to be integrating into the community not only as a resident but in business, Scott also commissioned a wonderful piece of street art on the side of the restaurant. 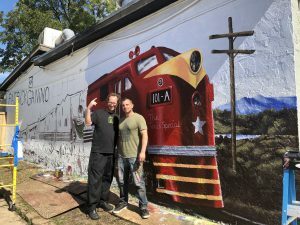 His childhood friend and world-renowned artist Patrick Ganino flew in from the east coast to design and paint a unique mural that reflects the local area. He wanted something that embraced Frisco’s heritage and the newly rebranded Rail District. Any day of the week you’ll find Scott not just overseeing kitchen operations, but checking in and chatting with guests in the dining room ensuring a friendly quality of service that will keep you coming back for more.